The China Pavilion at the 57th Venice Biennale in 2017 was curated by Qiu Zhijie, artist and the Dean of School of Experimental Art of CAFA. The four participating artists in this project are Wu Jian’an, Tang Nannan, Yao Huifen, and Wang Tianwen. Among them Yao Huifen is a master of Suzhou embroidery, and Wang Tianwen is a shadow puppet master. Works including video art, painting, sculpture, installation, embroidery, shadow puppet, and multimedia theatre performance were shown in the exhibition, accompanied by a broad range of archives and workshops. The theme ‘Continuum – Generation by Generation’ responds to the theme of this year’s Venice Biennale, ‘Viva Arte Viva.’ The source energy that powers the will to persevere, and makes possible the generational continuum, comes from the the constant interaction and inter-fertilization between the cultural elite and the folk, from generations of teachings past down from masters to their disciples, and from proactive collaborations. The highlights of the show include the unique wall of succession of teachings, collaboration diagram of the artists, the crossover collaborations among the artists, projections controlled by program-controlled mechanism and live VJ, and the shadow puppetry performance created by folk artists from Shaanxi and young artists together. 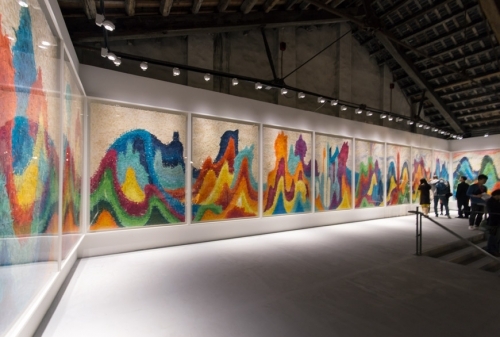 The exhibition of the China Pavilion at the 57th Venice Biennale in 2017, Continuum – Generation by Generation, gained attention from the international contemporary art world. Through out the half a year of exhibiting period, the China Pavilion received attention and wide praise with its strong visual impact, complete curatorial idea, and unique construction of context. The multimedia shadow puppetry performances during the opening period were especially applauded by the huge crowds gathered during each performance. The exhibition was generally praised by international art media and art professionals. The exhibition in Venice lasted half a year, then it took several months to be shipped back to China by sea. As planned before, the tour exhibition of China Pavilion at the 57th Venice Biennale Continuum – Generation by Generation, will open simultaneously at Shanghai Ming Contemporary Art Museum and Beijing Times Art Museum on March 31st, 2018. Given the different conditions of the space of the two museums from the rusty and industrial space of the Arsenal in Venice, we made some small adjustments of the works, and added works unseen before given the limitations of the Venice space. The curatorial idea remains the same, but with changing space and context, the exhibition will have different qualities from the one in Venice. However, audience who did not had the chance to see the show onsite in Venice can still appreciate the works and curatorial theme to a large degree. We believe that due to the fierce debate in China about the China Pavilion before, the returned tour exhibitions in Shanghai and Beijing became more valuable to the China Pavilion in Venice in 2017. Each Chinese artist, no matter folk or academic, is not working in solitude. His or her creation is always a kind of response, an opening up of a new trajectory, an anticipation of an antiphon, a commentary, a coda: an act of creation in a communal context. Chinese art is never an individual creation by a mortal Chinese artist, it is a communal act across five thousand years of our collective history, in which each artist both participates and responds: a kind of cross-generational yaji gathering. This year’s China Pavilion showcased the contemporary Chinese art to the world, it is a new production of the collective creation that spans across thousands of years. It is with great integrity, not wheeling and dealing for fast gains, but flowing freely after being reborn; it is not success through vicious capital speculation, but gaining recognition through influence and beckoning. It is a kind of all-encompassing new contemporary art that based on the backdrop of Chinese civilization, human relationship, inventive craftsmanship, and literary tradition.